The Greenway Trust has offered the Women in the Woods series since 2010 to address the gender gap in the trail community and build connections between outdoor enthusiasts. 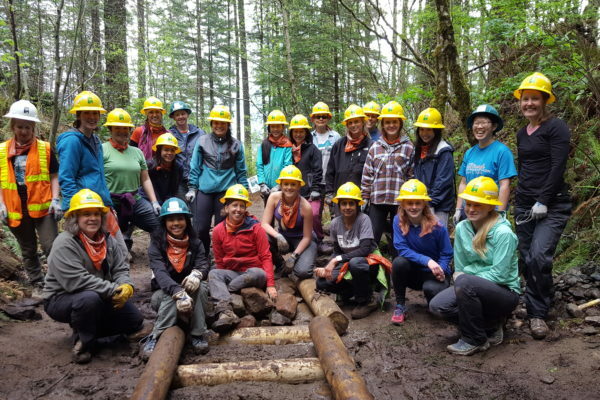 Whether you are a trail pro or are out to try trail work for the first time, Women in the Woods events are a blast. We strive to include women and girls ages 14 and up, and of all races, sizes, and gender expressions. Past Women in the Woods projects include constructing a rock wall on Little Si Trail (Fall 2010), constructing rock wall and turnpike on Little Si Trail (Spring 2011), trail maintenance on Twin Falls Trail (Spring 2012), constructing river crossings on Granite Lakes Trail (Spring 2013), trail maintenance on Squak Mountain (Fall 2014), culvert replacement on Tiger Mountain (Fall 2015), bridge construction on Tiger Mountain (Spring 2016), trail decommissioning on Little Si (Fall 2016), turnpike construction on Little Si’s Boulder Garden Loop Trail (Spring 2017 and Summer 2018), puncheon bridge and turnpike construction on Tinkham Discovery Trail (Spring 2018), trail maintenance on Thorp Creek Trail (Summer 2018), and hugelkultur creation on Little Si’s Douglas Fir Trail (Winter 2018). Save the date! Women in the Woods Kick Off! Thanks to REI for continued support of Women in the Woods. Thank you, Washington Department of Natural Resources and other partners, for your continued partnership and support of our Women in the Woods series. The Greenway Trust strives to be inclusive of all identities at our volunteer events. If you have a question, please contact Volunteer Program Coordinator Caroline Villanova (206.503.5463).